Tired of a secluded existence in the chilly mountains, this roguish feline decided she’d rather travel the world. Using brains and brawn, she established herself as the captain of a pirate ship and set out to sail the seas in search of treasure. 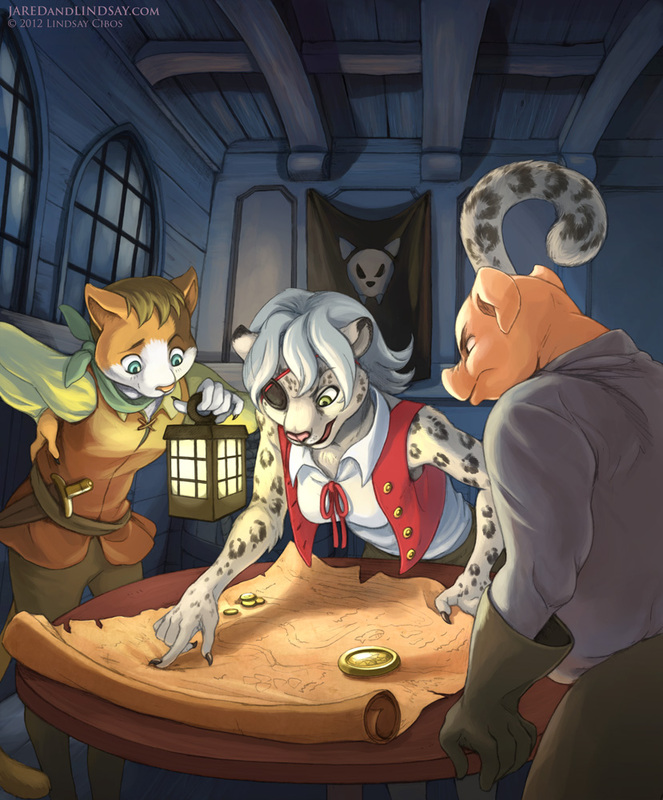 In this tutorial, I’ll show you how to draw an anthropomorphic snow leopard pirate, from rough concept to finished colors. 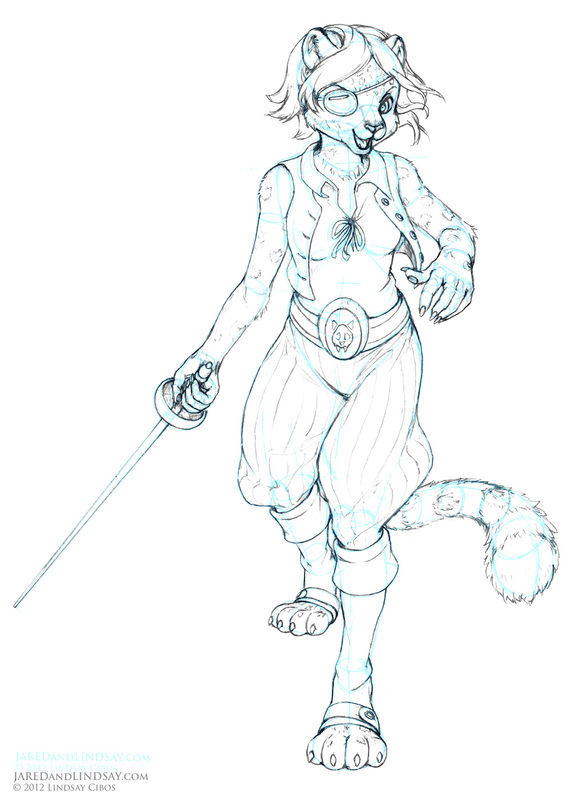 As you work your way through the steps, focus on imbuing the snow leopard’s pose with the confidence of a swashbuckler who knows what she wants…and isn’t afraid to take it! The key to drawing anything is to break it down into basic shapes. If you can draw circles and ovals, you can draw furries. Don’t be discouraged if your first attempt doesn’t turn out exactly like the picture. Practice makes perfect, so let’s begin! Start with some exploratory doodles of the character’s design, such as physical build, outfit, hair, and other details. Knowing a little bit about your character beyond just what they look like, such as their personality and goals, can go a long way in making a great drawing. Then do a series of gesture sketches to find the pose. Work small, under two inches for each to avoid getting caught up in details. Sometimes you’ll stumble upon the perfect pose with your first sketch, other times it might take twenty (or more) sketches to find the right pose–that’s okay! 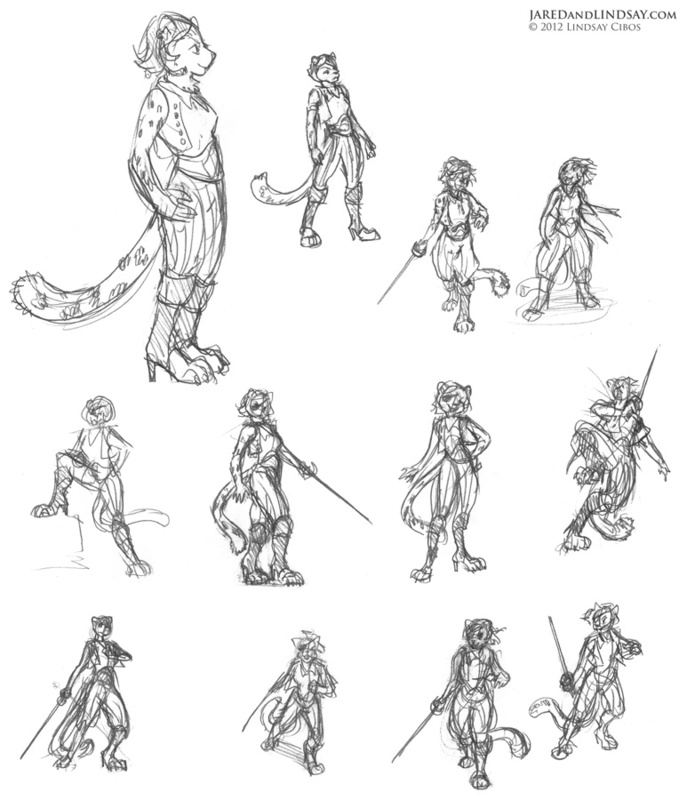 Look over your sketches and pick your favorite pose. I choose this one for its lively, energetic quality. 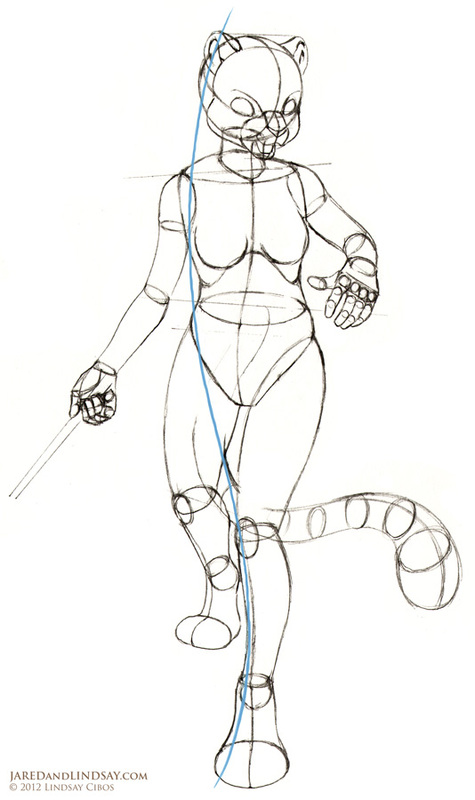 Begin with a sweeping line of action, and then sketch the shape of the head and torso along its curvature. Pay attention to the tilt of the shoulders and hips. As you draw, continue to refer back to your rough pose to keep your goal fresh in your mind. Use basic shapes to create the arms, legs and head. Align the forward facing left leg with the line of action to complete the sweep. Be sure to give the large puffy tail— a defining snow leopard feature—prominent placement. 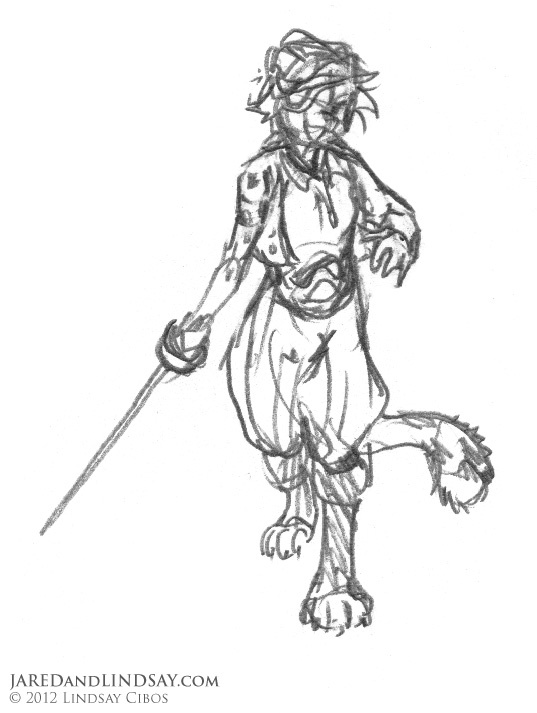 Use a ruler to sketch the general shape of a sword in her right hand, and then draw the fingers curving around it. Also use the ruler to line up the ears, eyes, and muzzle to ensure they are parallel to each other. Lightly sketch the general shape of the clothing to fit the body shape. Ignore details for now, and focus on proper placement. Always look for opportunities to play up to their animalistic features. In this case, give her open-toed boots to put her feline paws on display. Finish the ensemble by sketching the shape of her sword – a pirate’s trusty rapier! Detail the clothing with fancy buttons, and a decorative kitty-skull on the belt. Draw the stripes on the pants following the curves of the fabric. Give her hair flowing lines to suggest motion; perhaps it’s a windy day out on the high seas. Don’t forget the snow leopard’s ring shaped clusters of spots (called rosettes) along her tail and arms, and individual spots on the face and feet. Add claws, fangs, fluffy ears, and fur to complete the feline look. Erase your guidelines and tighten your lines for a clean finished drawing. Break out your favorite coloring tools! A snow leopard’s coat ranges from silvery gray to tan, with a white underbelly. 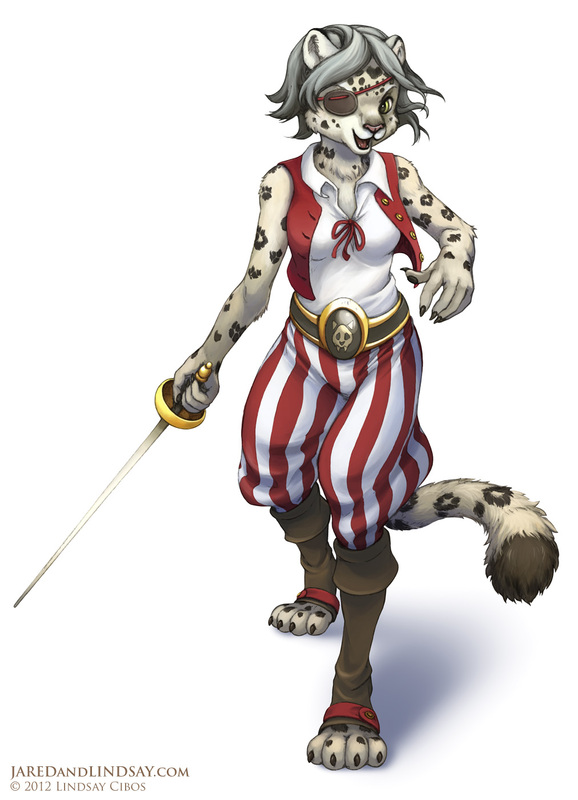 Choose colors for the pirate outfit that coordinate with her fur. I used classic pirate colors of red, white, and black, with a yellow accent, for a striking look. Don’t give up if your first drawings aren’t perfect. Art is not something that can be learned overnight. Drawing is a skill that must be practiced and supplemented through observation, so keep a sketchbook, and take it with you everywhere. Look around you, draw what you see. Visit the zoo and sketch animals. Sketch people at the mall. The more you draw, the better you’ll get. Good luck! 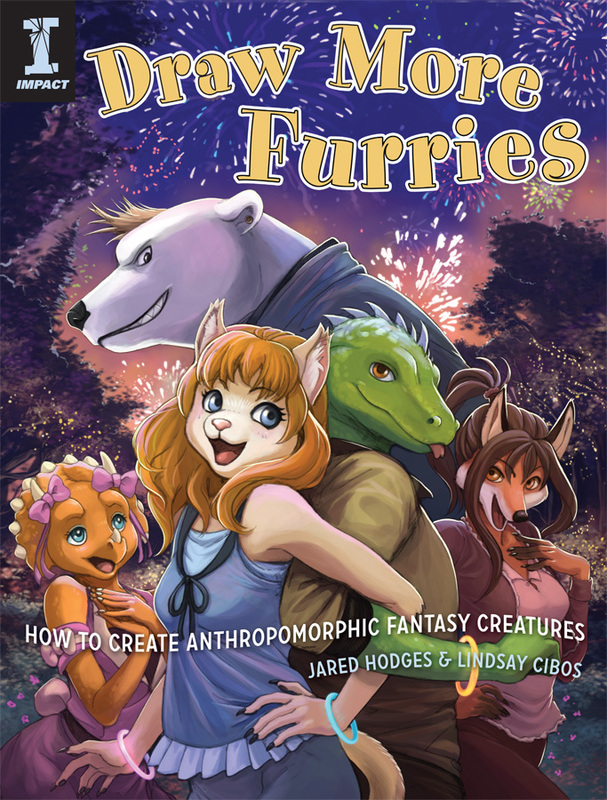 If you enjoyed this tutorial, check out my new book on drawing anthropomorphic animal characters, Draw More Furries! Click on the book cover below to learn more. Happy drawing!